Welcome to Spinners Cottage, brought to you exclusively by Character Cottages, local specialists in stylish Cotswold holiday rentals. Spinners Cottage is a beautiful Cotswold stone cottage, with a tranquil courtyard garden, which sits at the end of a short terrace of pretty cottages, in the heart of the picturesque market town of Stow-on-the-Wold. The medieval history of the town is beautifully preserved, including many lovely old buildings around the market square, which also contains a medieval stone cross, the old town stocks and a number of alleyways for the passage of sheep being herded to market, known as 'tures'. Sitting on top of a hill, Stow is well known for its many antique shops, pubs and restaurants, as well as for the many lovely walks through the surrounding Cotswold countryside that are accessible directly from the town. The location is also ideal for exploring the wider region, including the many beautiful towns and villages of the Cotswolds, as well as further afield places, such as Stratford-upon-Avon, Oxford and Bath. Spinners Cottage sleeps four people, in two bedrooms, with two bathrooms. There is a pretty, walled courtyard garden at the front of the property, complete with a table and seating for four. Free on street parking is usually available close to the cottage, and the owners also provide a parking permit for the main village car park, a short walk away from the property. 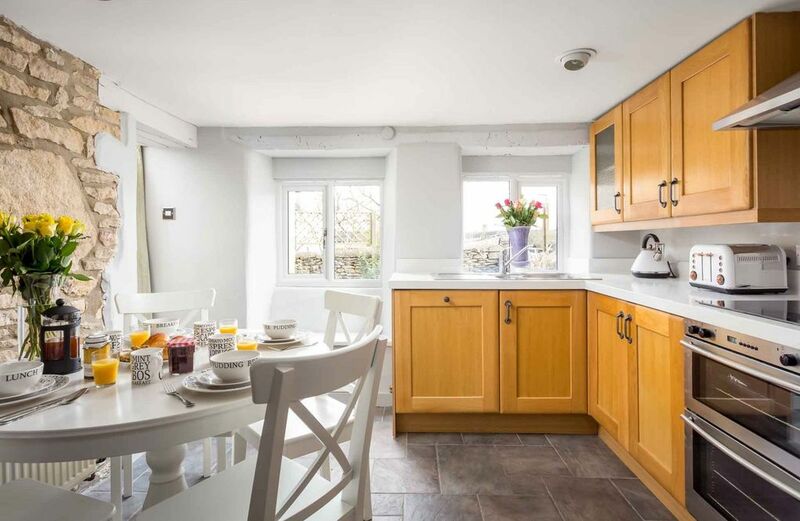 Spinners Cottage is perfect for a family or a small group of friends seeking an idyllic retreat in the heart of one of the Cotswold's best loved market towns. Up to two medium sized dogs are accepted, at a cost £20 per booking per dog. The property's courtyard garden is enclosed, however, the neighbouring properties have a right of access through this garden, which could result in the gate to the road or the gate to the neighbouring property not being closed properly. Consequently, dogs should be supervised outside at all times. The property's courtyard garden is enclosed; however, the neighbouring properties have a right of access through this garden, which could result in the gate to the road or the gate to the neighbouring property not being closed properly. Consequently, young children should be supervised outside at all times. If you would like to read more about the property’s features, then feel free to get in touch by searching the web for Spinners Cottage Character Cottages! Thank you for your delightful review, Karen. We are pleased to hear that you had an enjoyable stay in the Cotswolds and that you thought the cottage was charming! We hope that you visit again soon. Thank you for your fantastic rating! Car: Stow is conveniently located at the junction of seven roads, including the A429 (Fosse Way), and is easily accessed by car. Train: The nearest railway station to Stow is Kingham (approximately 5 miles away), which has regular, direct services to London Paddington, with a typical journey time of approximately 90 minutes.